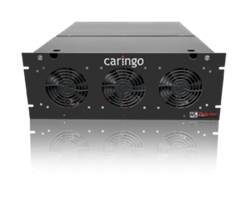 Since last year’s NAB Show, Caringo has introduced a simple way for organizations to get started using Swarm by offering it on the Swarm Single Server Appliance. This new solution was designed to meet the needs of small- to medium-sized content-driven organizations. Caringo, Inc. today announced that it will return to the upcoming National Association of Broadcasters (NAB) Show in Las Vegas, April 8–11, 2019, Booth SL13310. The masthead Caringo product Swarm, a content-focused storage platform, provides organizations with secure access, distribution and long-term retention. With both S3 and NFS access to the same content, Swarm protects files at exabyte scale and enables streaming & longtail video-on-demand, centralized backup, distribution for collaboration and tape replacement. Since last year’s NAB Show, Caringo has introduced a simple way for organizations to get started using Swarm by offering it on the Swarm Single Server Appliance. This new solution was designed to meet the needs of small- to medium-sized content-driven organizations. The on-prem, S3-accessible, object-based storage device contains all the hardware and software organizations need to keep archived content online, searchable, web-accessible and secure. It requires only one-quarter of the hardware of a typical object storage deployment and organizations can easily scale and add capacity as needed by simply plugging in another appliance. With a number of storage experts on-hand at the NAB Show, the Caringo team will showcase how Swarm can streamline workflows by enabling on-demand access from the archive. The Caringo team will also show integration with widely used asset and content managers including CatDV, Masstech, Pixit Pixstor, Vidispine, Cantemo, Marquis and ReachEngine. Caringo will also be featured at the JB&A Pre-NAB Technology Event on Saturday, April 6 and Sunday, April 7. This a must-stop event on everyone's NAB itinerary for a jump-start on the new technologies that will be seen on the NAB Show floor. Interested parties can visit https://www.caringo.com/caringo-media-entertainment for more information. Caringo was founded in 2005 to change the economics of storage by designing software from the ground up to solve the issues associated with relentless data growth. Caringo’s flagship product, Swarm, decouples data from applications and hardware providing a foundation for continued data access and analysis that continuously evolves while guaranteeing data integrity. Today, Caringo software-defined object storage solutions are used to preserve and provide access to rapidly scaling data sets across many industries by organizations such as NEP, Argonne National Labs, Texas Tech University, Department of Defense, the Brazilian Federal Court System, British Telecom and hundreds more worldwide.